A report prepared by the Panel of Experts for the Steering Committee based on the Interim Report, six Sub Committee Reports, the Report of the ad hoc Sub Committee assigned to look into the relationship between the Parliament and the Provincial Councils were presented to the Constitutional Assembly yesterday. As the Steering Committee was unable to reach common ground on most of the areas under discussion to prepare the proposed draft, the Steering Committee Chairman Prime Minister Ranil Wickremesinghe wanted the members to decide the next step following the presentation of the reports. The first report elaborates on Fundamental Rights and Freedom, Language Rights and Directive Principles of State Policy, which are the chapters proposed by the Sub Committee on Fundamental Rights. The chapter on Citizenship was reproduced from the present Constitution. Political party representations in the Interim Report of the Steering Committee and the comments and letters submitted by Members of the Panel of Experts are found as schedule I and II to the report, respectively. 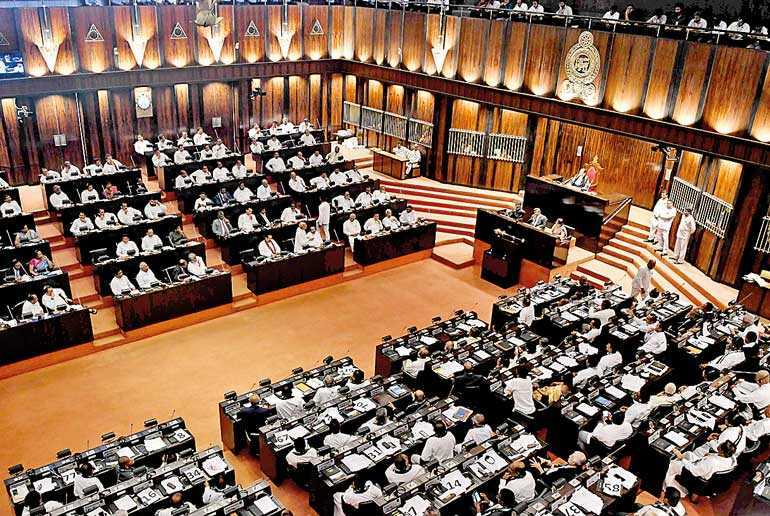 A subject-wise summary of the speeches made at the debate on the Interim Report of the Steering Committee at the Constitutional Assembly and the recommendations submitted by the Chief Ministers of the Provincial Councils were among the reports moved. Moving the reports, the Prime Minister wanted the members of the Constitutional Assembly and the general public to read them all and take them up for discussion as per the decision taken by the Steering Committee on 25 October 2018. “The purpose of today’s Constitutional Sitting is to table these reports. It was decided on 6 September 2017 to present the Interim Report to the Constitutional Assembly on 21 September. The debate went on for a few days and we were able to collect many important proposals from the members. Even though we are supposed to present Draft Constitutional Proposals, we decided not to in the absence of a two-thirds majority support. Instead we presented these documents, allowing the assembly to resolve the next step as per a decision taken on 24 May 2018. On 6 September 2018, the Committee resolved to submit the draft document to the Constitutional Assembly as a draft from the experts without a party position post discussion with all members,” he said. Rejecting the United People’s Freedom Alliance’s (UPFA) charges of the country being divided, Buddhism getting lesser recognition, and the Northern and the Eastern Provinces amalgamated in a non-existent draft Constitution, the Prime Minister nonetheless held that all opinions should be listened to. Having tabled the reports instead of a draft, the Prime Minister wanted the members to decide the next move where the Steering Committee has finished its task. “Now this august assembly should decide what we should do next. There were no plans to divide the country, but those who are politically bankrupt wanted to misinform the public. In the absence of other matters, they look at spreading rumours to say the country is divided, that Buddhism will not have prominence, and the Northern and Eastern Provinces will be amalgamated,” he said. According to the 1978 Constitution, Article 2 recognises the Republic of Sri Lanka as a unitary State, and Article 9 in Chapter II states the Republic of Sri Lanka will give to Buddhism the foremost place and accordingly, it will be the duty of the State to protect and foster the Buddha Sasana, while assuring to all religions the rights granted by Articles 10 and 14(1) (e). “Former Prime Minister Dudley Senanayake added Buddhism to the 1972 Constitution. Nobody will want to remove this and will want Article 9 of the current Constitution to remain as it is. We will not touch Article 9. We will consider if there are proposals with regards to other religions. There is no federalism in it but a unitary State. We are looking at devolution of power in a unitary State. We are yet to discuss the elections system, especially after the constitutional crisis and also the abolishing of the Executive Presidency. The United National Party (UNP) position is that Article 2 and 9 will be protected and a new Constitution will be drafted. Just because we present you the opinions which are unfavourable it does not say that those will be allowed in the new Constitution. We will get opinions we agree and disagree with, which we will have to consider,” he added, highlighting the fact that a two-thirds majority is necessary to do a draft. Leader of the Opposition Mahinda Rajapaksa, who was on feet, wanted the Steering Committee to present its draft instead of the reports tabled. “We will need time to study these reports. You should have tabled either the draft or at least the standpoint of the UNP, enabling us to debate on it. On the other hand, there is a question of the legitimacy of this Parliament. We don’t see much presence on the Government side, and the current Government lacks legitimacy having lost the Local Government election,” he said. Proposing the UNP dissolve the Parliament and go for an election with its draft, the Opposition Leader said: “You have gone to the courts to stop a General election. The court decision has insulted the Parliament. Don’t mislead the public or the Parliament. Just let us know what you are planning to do. We should accept that Sinhalese don’t have the right to trample any other race. Consensus is necessary among the races. Don’t establish political hatred,” he said while rejecting his presence at the vote to pass the 19th Amendment to the Constitution. MP Sampanthan also appealed the members to read the reports objectively and to endeavour to draft a new Constitution for the betterment of the country and its people. Janatha Vimukthi Peramuna (JVP) MP Anura Dissanayake criticised UPFA for spreading false information with a non-existent draft. “We were at the Steering Committee and the experts in the panel were unable to reach a common agreement. They, too, have made four groups and presented this report. We strongly oppose the 1978 Constitution. We got involved in the Constitution-making process along with those who are spreading false information out to the public. There is a process for drafting a Constitution and approving a Constitution. They are politically-compromised. Baseless allegations were brought, spreading false information. The Steering Committee has met 83 times during the last three years and have failed to reach an agreement on basic matters. In the absence of a draft prepared with common agreement, how can a Constitution-making process proceed? All what we see is that the Prime Minister has tactfully avoided drafting a Constitution,” said MP Dissanayake, who said that there is no purpose for having a Steering Committee which is unable to do a draft Constitution.